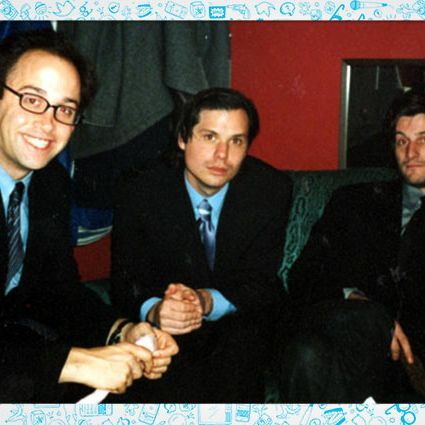 In the mid-nineties, Michael Ian Black, Michael Showalter, and David Wain — whose sketch group the State had scattered after their unsuccessful 1995 CBS special — frequented New York City’s alternative-comedy haunts Rebar and Luna Lounge to perform and watch scene staples like Louis C.K., Janeane Garofalo, Todd Barry, Marc Maron, and Jon Benjamin. Evenings there “were long, meandering shows because it was experimental,” recalls Wain, “and we thought this was a genre of comedy that needs its own not-first-draft-type night.” And so he, Black, and Showalter launched a weekly show where these comics and sketch groups could present spit-shined pieces, while the three hosts could perform the goofy, high-concept bits they’d wanted to perfect. They found a venue for a weekly variety show at Fez, a dark club under the now-defunct Time Café, and dubbed their showcase “Stella” after Fez’s very pregnant booker told them that was what she was going to name her baby. On January 15, 1997, the three men dressed in suits (this was the Swingers era, after all) and began two years of weekly Wednesday shows for which they served as bickering emcees. Backed up by their house band, led by Mr. Blue, they introduced acts like the original UCB, Garofalo, Maron, Zach Galifianakis, and Patton Oswalt, along with staples of the traditional clubs like Jon Stewart, Caroline Rhea, and Dave Attell. Stella helped cement New York’s alternative scene as less of a ramshackle assembly of comics, and paved the way for shows like Eugene Mirman’s Pretty Good Friends and Max Silvestri’s Big Terrific. After discovering some old pictures from this memorable ongoing show, we called up Black, Showalter, and Wain and asked them to reminisce.